Having provided dozens of articulated, and even more disarticulated skeletons of marine reptiles with varying degrees of completeness, the Middle Triassic fossil deposit of Winterswijk, The Netherlands, might be considered the richest within the entire Germanic Basin concerning associated and partially articulated remains. Aside from these remains, a high number of isolated bones are also found. Among the various marine reptile taxa, the pachypleurosaur Anarosaurus and the nothosaur Nothosaurus are the most common. The skeletons and remains show diverse disarticulation patterns. These patterns range from mostly complete articulated skeletons to clustered and isolated bones. Interestingly, a large number of isolated articulated limbs is found, a pattern which is not known from other marine localities. Although numerous reports have been made on the taxa from Winterswijk, the taphonomy of the locality still remains poorly understood. Here, a series of methods are used to describe the taphonomy of 327 marine reptile specimens from the locality of Winterswijk in a qualitative manner. Furthermore, it is tested whether biofilms such as microbial mats could have had an influence on the preferential preservation of several body regions. Upon investigation, it is concluded that the taphonomy of Winterswijk is very complex and indeed depends on various factors such as: current activity, microbial activity, and anatomical differences between taxa. Finally, a total of 12 recurring patterns were identified within the dataset, which could largely be explained by the aforementioned factors. Handling Editors: Hans-Dieter Sues and Walter Joyce. The online version of this article ( https://doi.org/10.1007/s12542-018-0438-0) contains supplementary material, which is available to authorized users. First of all, we would like to thank all the members of the Werkgroep Muschelkalk Winterswijk for their manifold support, for access to their private collections, for providing any help and further contacts. Discussion with Dennis Voeten and Melanie During contributed greatly to the understanding of the paleoenvironment. We are grateful to Sibelco Europe MineralsPlus Winterswijk, which operates the Winterwijkse Steengroeve, and provided access to the quarry as well as any logistical support possible. We thank Henk Wim van Dorssen and Dennis Nieweg for their kind hospitality at the Museum TwentseWelle, Enschede, and Miramar Zeemuseum, Vledder, respectively, during several visits to the collections under their care. Furthermore, this study would not have been possible without access to numerous private collections. These are the collections of (in alphabetical order): Wim Berkelder (collection now at TwentseWelle, Enschede), Jan van den Berg, Erik Bleeker, Remco Bleeker, Peter Formanoy, Richard de Haan, Adam Haarhuis, Remco Jalink, Charles de Jong, Harry Kasemir (collection now at Naturalis), Jos Lankamp, Marco Liebrand (collection now at Naturalis), Ben Oostendorp, Henk Oosterink, Cornelis Put, Oliver J. Sichelschmidt, Gerben Spanjaard, Herman Winkelhorst, and Bernd Wolfering. We thank Georg Oleschinski (StIPB) for the brilliant photographs of specimens and Olaf Dülfer (StIPB) for excellent preparation of many specimens. Additionally, we thank Mirjam Cahnbley for proofreading several versions of the manuscript. Last, but not least, we would like to thank the reviewers Eberhard Frey and Heinz Furrer, as well as the editor-in-chief Mike Reich, for their comments on a previous version, and their suggestions that greatly improved the final version of the manuscript. Hagdorn, H., and T. Simon. 2010. Vossenveld-Formation. Litholex (Lithostratigraphische Einheiten Deutschlands) ID 45: 1–6. 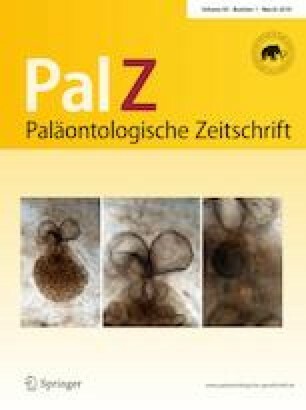 https://litholex.bgr.de/gesamt_ausgabe_neu.php?id=45.